What have companies and institutions like NASA, Sky PIC, Texas University, SWISSCOM, Bank Austria and many others in common? They are all customers of Bacula Systems, known for their backup product called Bacula Enterprise Edition. Bacula is the first product I have reviewed that has one significant advantage over any other product/vendor. That feature is called open source. Open source is a powerful thing. When the source code of the program is available to everybody to see, you can expect that problems will be spotted faster and code quality will be better as opposed to closed source programs. Also, if the platform is open, there are more options available if the vendor goes out business, and gives your company more reassurance that the backup solution is here to stay (Veritas – Symantec – Veritas customers will know what I am talking about). When you test software, it’s crucial that the first experience is exceptional, as your first experience defines how you feel when using the software. I will never forget my experience when testing IBM Director – Java version, (not that the web version was much better!). The product was so unintuitive that my agenda was simply to find a replacement. Bacula Systems know that, and so they created the Bacula Trial Edition Kickstart Guide. With this guide, they made sure that first experience is as good as it can be. They have explained terms, the location of manuals, provided a download link, described the way you can contact them, and best of all, they present six most common backup scenarios. That way, if you dedicate at least 5 minutes of your time reading the guide, you will know how and why the product works, and what to do if you are stuck. The first experience that users have with Bacula is undoubtedly significant. Unlike “modern” backup programs, where usage is limited to one or two supported hypervisors with the mandatory Windows-based host for installation, Bacula, gives you a choice. You can use a web interface which you can use from the comfort of any operating system and a browser or you can SSH into the Bacula Enterprise server and do everything in the terminal. Kids these days don’t know that many companies, banks, and institutions where the highest reliability is required, still use UNIX and Linux exclusively for their datacenters. Let’s take a quick look at the web GUI. On the dashboard, you have information about the last jobs, info about the running jobs and graphical statistics showing you the size of the backup and time. You also see a statistics about the clients, number of jobs and failed jobs in the last seven days. In the menu, you can manage clients, Jobs, Storage, Configuration and look at statistics. Just like in the web browser, you can manage your backup via terminal. You can start Bacula console and then choose from the menu desired option. Here you can look at the jobs, run jobs and create jobs. In fact, you don’t even need web management, as all tasks can be done via terminal. There are many backup products to choose from. Some are basic, and some are Hyper-V and VMware exclusive, others claim to be Enterprise grade but have horrible user experience or stability issues. In the end, there are just a couple of vendors that are both reliable and have enterprise features, but the prices are exorbitant. Looking at enterprise options, with Bacula you can save up to 80% for backup software. It is built modularly so that you can use the terminal and the web browser simultaneously, and the modules can be enabled as required. It has excellent support for operating systems, tapes, autoloaders and the list of databases it can back up is impressive just as the list of supported hypervisors is. Bacula keeps surprising. The list of applications it supports is one of the largest in the industry. Some backup companies focus on application support only for Microsoft applications. On the other hand, Bacula has support for all major platforms and applications. From the operating systems, it supports Microsoft Windows, Linux, Mac OS X, AIX, UNIX and even Solaris. MS Exchange backup uses Microsoft VSS for backup consistency and can perform single mailbox recovery. In fact, MS Exchange backup is very well thought out. For example, to maximize space savings, Bacula has implemented virtual full Exchange backup solution with compression and deduplication to reduce storage to the minimum. Bacula was designed to deliver performance for Microsoft SQL backup which is fully supported. You can choose from Full, differential, and incremental backup. You can use MS VSS, or you can choose to use MSSQL server backup tool which uses the Microsoft API for SQL server. You have many strategies for restore as well: you can restore database backup ﬁles to disk, restore an original database backup, restore database backup with a new name, restore database backup with a new name and ﬁle relocation. 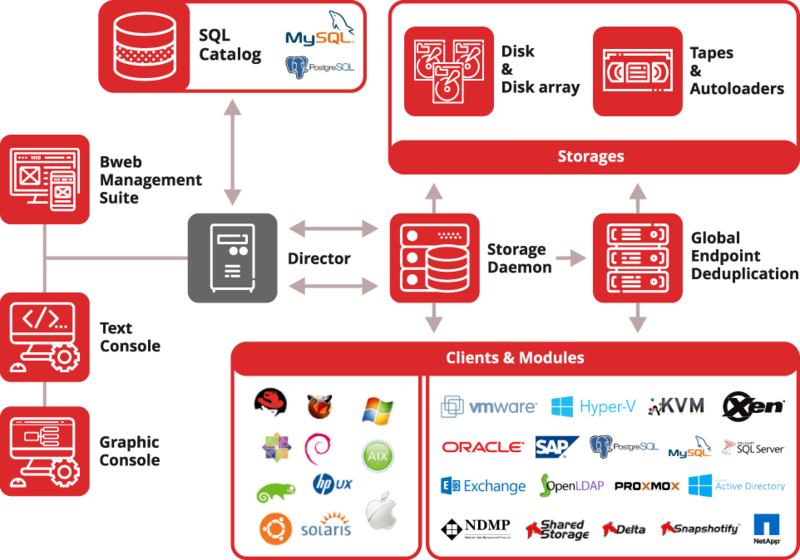 MySQL and Postgres are both Open Source software; backup implementation is a first class just like the core of Bacula. You can choose from DUMP to PITR (Point In Time Recovery) database strategies. For Oracle database backup you have can also choose from either “Dump” or Point In Time Recovery (PITR) through Oracle Recovery Manager (RMAN), which is tightly integrated. Bacula is integrated – and certified by – SAP HANA as well. Because Bacula does not charge by data volume, backup, recovery, migration, cloning & replication of databases are able to be done freely without being penalized for increased data volume. Extensive virtual environments support is something that cloud and hosting companies will celebrate. Bacula Enterprise is one of the few if not the only backup solution that supports all major virtual environments. Organisations can integrate Bacula with VMware, MS Hyper-V, KVM, XEN, and Proxmox. Wow. 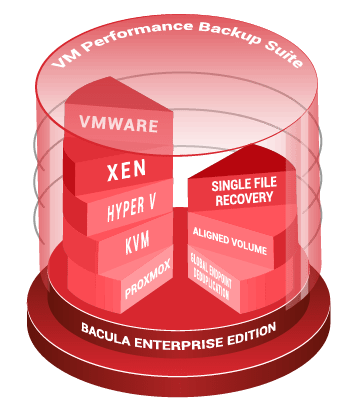 So far, Proxmox, XEN or even KVM users have had a limited choice regarding backup, but with Bacula, the world of possibilities is now open. If you are an MSP, imagine that you have a great backup product for your own infrastructure. When you know the program, its internals, how it works, it becomes a natural step to extend your business and offer backup as a service to your valuable customers. Your goal is to make additional revenue, and if you can offer a reliable service, your customers will love you. Bacula Enterprise has many benefits for backup as a service including awesome tools for self-service, comprehensive REST API capabilities, GUI and text interfaces. You can use BCloud Service to allow your customers access to the backup, or even allow junior administrators access to only what is needed of Bacula’s underlying backup infrastructure for their tasks. How does Bacula Enterprise compare to other vendors and who is it for? Bacula implementations typically displace other high-end solutions. It offers a highly modular, customizable and scalable alternative that is exceptionally reliable and stable to use. Customers are highly enthusiastic about the quality of Bacula’s customer support. Unlike other enterprise products, because Bacula does not charge by data volume, it is the large data centers that stand to make the most impressive price savings. In fact, what typically costs a fortune from Enterprise vendors, is relatively just a fraction of that with Bacula. 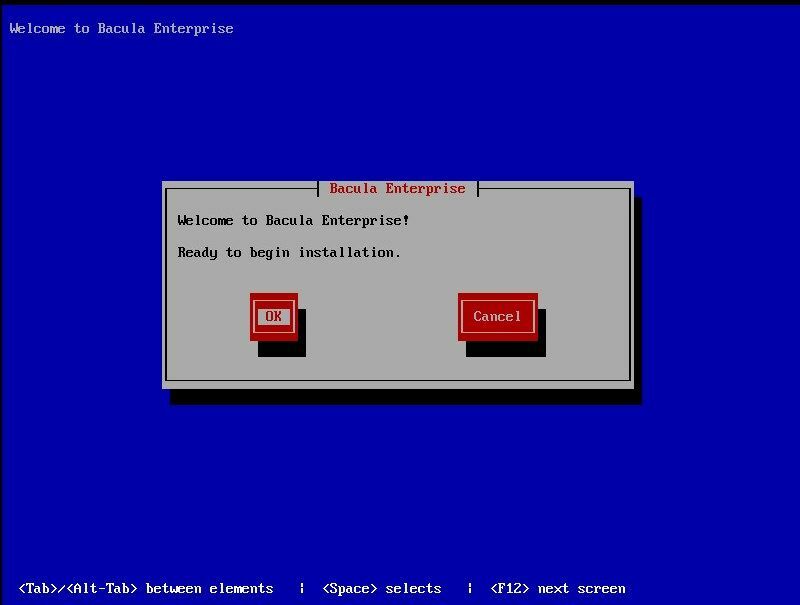 While Bacula Enterprise can be found in organizations with hundreds or even thousands of servers, it also has special versions like Small Business Edition, which covers up to 25 servers. Also, MSPs can request a dedicated pricing model that takes into account their business specificity and is available upon request. What I like about Bacula is that it is stable and it supports just about anything that exists on the market, including XEN and Proxmox. Its base is open source and can be subject to quality code review from various institutions or governments. You can count on it having all the modern technologies like deduplication and self-healing. If you are using one of the “major” enterprise vendors, maybe it is time to check Bacula’s savings, support quality and special features.